The interdisciplinary study of law and religion encompasses many subfields, ranging from constitutional law to professional ethics. Among the most promising work in the field is that which aims to bring the resources of constructive theology to bear on legal thought. 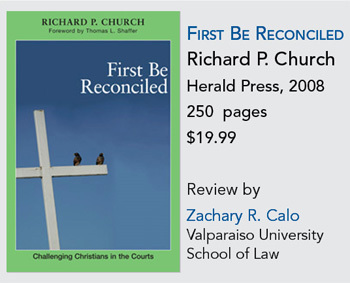 Richard P. Church’s book First Be Reconciled: Challenging Christians in the Courts represents an important contribution to this theological turn in legal scholarship. Church’s ap­­proach is distinct, however, in that he does not ask how theology might illuminate legal thought, but rather how theology might shape the church’s disposition toward law. A theologian and practicing attorney, Church argues against the dominant approaches to law within Christian thought and practice—approaches that he sees as having allowed the church uncritically to accept litigation as a replacement for authentic reconciliation (13). As an alternative, Church considers the witness of the Anabaptist tradition and offers the following challenge: “If peace is then more determinative than the absence of violence, if the reconciliation of God to human and human to human is the heart of the good news, what then of litigation?” (16). In examining the question “what then of litigation,” Church turns to 1 Corinthians 6: 1–11, in which Paul writes, “When any of you has a grievance against another, do you dare to take it to court before the unrighteous, instead of taking it before the saints?” Church is clear in his understanding of this passage’s implications. To borrow from a poster of some years ago that read “A Modest Proposal for Peace: Let Christians Stop Killing Christians,” the modest proposal of First Be Reconciled is “Let Christians Stop Suing Christians.” By so doing, the church might embody a radical ethic of peace in relation to litigation, a sphere of subtle violence often ignored in Christian ethics. While much ink has been spilt on the proper response of Christians to more explicit forms of violence, the coercive character of law has remained largely unexamined and uncriticized. Yet, for Church, litigation demands to be treated with the same theological seriousness as war, especially given its omnipresence in contemporary American life. The book admirably succeeds as an admonition for Christians to reconsider the nature of their participation in litigation. At a minimum, it encourages the church to confront the oft-ignored scriptural witness of 1 Corinthians. In fact, part of the book’s success comes simply from its being disarming. In a litigation-saturated culture, where law is the regnant language and means of ­mediation, merely calling into question the propriety of litigation can be a radical act. Yet Church ultimately goes further in also calling for a rethinking of litigation in light of the church’s eschatological vocation as a community of forgiveness and reconciliation. This is a serious work of theological scholarship that addresses the various ways in which 1 Corinthians 6 was interpreted by Augustine, Luther, and Calvin. Church is well aware that Anabaptist ecclesiology, particularly as it concerns the church’s relationship to political institutions, stands at odds with much of the received Christian tradition. Church’s critical analysis of the tradition shaped by these three seminal thinkers is a valuable scholarly contribution in its own right. However, even with its sophisticated exegesis of 1 Corinthians and its discussion of Augustine, Luther, and Calvin, the book is not concerned principally with developing a traditional scholarly argument. Church rather approaches his subject from a practical and even pastoral perspective. First Be Reconciled is a book written for the church, calling on the community of believers to critically consider the ways in which litigation has informed Christian practice. The book gently prods by pulling the reader into an alternative moral universe—what Church terms “an imaginative experiment” (105)—rather than by advancing a top-down theological argument. It is important to take this book on its own terms and not to fault it for failing to be a book of a different sort. There nevertheless are limitations that arise from Church’s decision to not build his argument around a constructive theological account of law. As it is, the book might encourage a certain rethinking of Christian approaches to litigation, but it seems unlikely to effect more fundamental shifts in theological orientation among those who do not adopt Anabaptist ecclesiology as a starting point. Establishing the normativity of the Anabaptist approach would require a deeper engagement with the full complexities of Christian reflection on law and politics. What, for instance, of the natural law tradition? Of Romans 13 as a counterpoint to I Corinthians? In different ways, much of the Christian tradition has held that law is a God-given tool for the maintenance of justice, the upholding of the created order, and the ­enactment of judgment. By not grounding his claims in a more systematic theological assessment of these and other relevant issues, Church necessarily turns to the aesthetic appeal of the Anabaptist witness. I cannot say that a book organized around the development of a Christian theological jurisprudence would have been better, but it would certainly have been a book of a quite different order. And it would have been, in certain respects at least, a more ambitious book with the potential to be broader in reach and deeper in impact. Another difficulty with the book as currently structured is that it neglects fully to define the scope of its claims. Church is clear in arguing that Christians ought not litigate with other Christians. Matters are less clear beyond this principle. What, for instance, of litigation with non-Christians? Of commercial litigation? It is uncertain, moreover, how Church understands the relationship of Christians to the criminal law, for First Be Reconciled only addresses civil litigation. Are Christians to advocate restorative justice over criminal punishment? Equally so, what of Church’s answer to the question Thomas Shaffer offers in the foreword—should a Mennonite become a lawyer? Given the book’s narrative approach, it would have been interesting for the author to have discussed his own vocation as a lawyer and the terms on which he finds such work to be compatible with life in the church. In the end, Church declines to name a principle that might provide resolute answers to these questions. It is the challenge of the book, he writes, to resist “the desire for black-and-white answers to the problems that face Christians living in-between the times” (133). This might well be the case, but it does seem to avoid a needed engagement with those deep impulses pregnant within the Anabaptist tradition that might feed a more totalizing withdrawal from law, just as they would endorse a totalizing withdrawal from the instrument of war. I suspect that the approach taken in the book reflects Church’s commitment to locating his analysis within the church’s inner dynamic life. In the end, this is a book not only about litigation but, equally so, about discerning what it means for the church to be a reconciling community in medias res. Thus 1 Corinthians not only expresses the principle “thou shall not sue other Christians,” but also the deeper ecclesial logic that informs the church’s disposition toward the world. From this perspective, the task before the church is not to address for all time whether Christians can engage in litigation with non-Christians, but rather to ask how the church ought live out its eschatological vocation. And herein lies the great strength and potential of First Be Reconciled, for even those who do not accept its starting point or its final conclusions cannot but confront the ways in which legal liberalism has subtly undercut the church’s redemptive work. It is the book’s avoidance of clear and simple answers that makes it haunting and ultimately quite effective. Zachary R. Calo is Associate Professor of Law at Valparaiso University.